Building an infield that will perform well for years to come begins with superior products. Often thought of as a product to eliminate rainouts, Turface® also helps address the issue of cracked, rock-hard infields seen during hot and dry summer weather. No two areas on the diamond receive more abuse than on the mound and around the plate. Building and maintaining them is critical to the safety of players and the performance on the field. Preventing rain outs and reducing field damage during wet playing conditions are two key challenges faced by groundskeepers. Fortunately, Turface® conditioners are designed to help on both accounts. Turface offers high quality products and key maintenance tips to help get your field in championship form to wow players and spectators alike. You'll see that when it comes to maintaining your expensive sports turf investment, it pays to start by maintaining your soil. 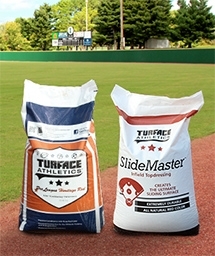 Strive to create a soil mix containing 10-20 percent Turface®. Ideal soil balances air- and water-holding pore space, resists compaction, holds nutrients and provides turf with a growing medium.